I'll be on the road here soon, so no blog posts for a while. But while I'm gone, I'll be watching the Olympics. Track and field, wrestling, swimming, ping pong. Whatever. I'll watch it all. If you're looking for something to get you into the Olympic spirit, check out my friend Chris Gehrz's article at Pathos, "Religion in The Olympics… and The Olympics as Religion." Chris takes readers on a helpful tour of the many ways that Christians and other adherents have participated in the Olympics. He then considers the religious sensibilities of the games themselves. So we can look at sprinter and "muscular Christian" Eric Liddell, who in 1924 bypassed the 100-meter dash because it was scheduled for Sunday. It's a story that has become legend thanks to the award-winning film Chariots of Fire, which did some significant tinkering with the history to make it more dramatic than it really was. Indeed, other than in the movies, we don't see much strident sabbatarianism from today's Christian athletes. But we do find Muslims dealing with similar issues now. Chris points to 2012, when over 3,000 Muslim athletes had to make a decision on whether or not to maintain their Ramadan fast through the games. And then there is Pierre de Coubertin. The founder of the modern Olympics once remarked, "The first essential characteristic of the Olympics, both ancient as well as modern, is to be a religion. ... [I]t represents, above and outside the Churches, humanity's superior religion." Put another way, the Olympics, for Coubertin, were more than just fun and games. They were to be a transcendent celebration of fair play, amateurism, and global diversity. Not all of this works out as planned, of course. But hey, he tried. Anyway... Chris does well in this section to bring in Allen Guttmann's masterful history of the Olympics and Elesha Coffman's excellent article on the Christian roots of the games. So some good reading as the games begin. While you are watching the Olympics, make sure to check out the men's 800 meters. 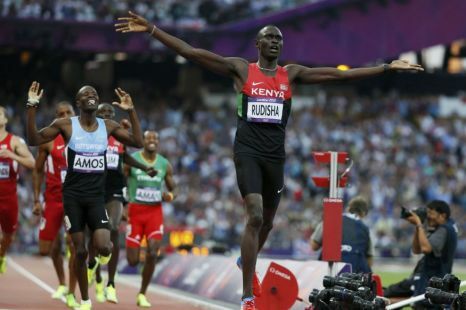 I suspect that you will see Kenya's David Rudisha. Back in 2012, he owned the finals of that race, leading from start to finish. He came through 400 meters at 49.28 and finished with a world-record time of 1:40.91. The field of runners behind him turned in a collection of spectacular times too. But that day belonged to the Kenyan Rudisha. Watch the race. I still get chills seeing someone excel on that stage with that degree of dominance. If you are interested to know more about this amazing runner's backstory, here is an article about Colm O’Connell, the Irish missionary who trained Rudisha. The retired geography teacher from rural County Cork in Ireland is a balding, portly, 5ft 6in, 67-year-old missionary from the Patrician Brothers order. Since 1976 he has lived in the remote town of Iten, 8,000ft above sea level in Kenya’s North Rift Valley, having turned down the chance to go to California the previous year. He readily admits he knew nothing about athletics coaching when he arrived in Kenya for what he thought was going to be a three-year contract to teach. But he was drawn to it as a way of getting to know the boys after listening to the Montreal Olympics on the BBC World Service just days after arriving. “To be an athletics coach would not seem to be a conventional missionary role,” he says.